Cornell celebrated its first inauguration on Oct. 7, 1868. At the ceremonies, New York Lt. Gov. Stewart L. Woodford administered the oath of office to President Andrew Dickson White and presented him with the charter, seal, and keys of the university. For all of Cornell’s early inaugurations, the charter and seal represented the symbols of office. 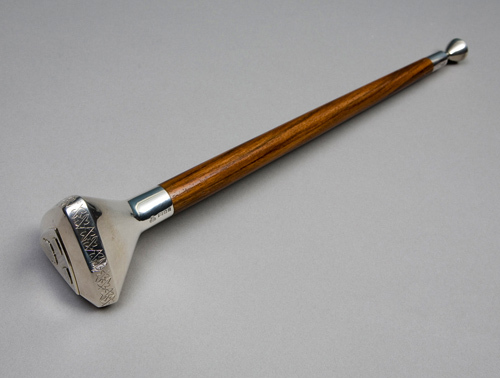 The inauguration of James A. Perkins as president in 1963 was the occasion for the first presentation of the university mace and university baton as symbols of authority. As the land-grant university of New York State, Cornell was chartered through an act of the New York State Legislature, signed into law by Gov. Reuben E. Fenton on April 27, 1865. The university’s founder, Ezra Cornell — who was chairman of the Senate Committee on Agriculture at the time — had pledged to provide an initial endowment of $500,000, along with land, buildings, and equipment in return for the state’s pledge to provide to the new university the entire income from the sale of public lands granted to New York pursuant to the Morrill Act. The legislation was introduced in the New York State Senate by Andrew Dickson White, who subsequently became the university’s first president. The mission of Cornell was stated as follows: “The leading object … shall be to teach such branches of learning as are related to agriculture and the mechanic arts, including military tactics, in order to promote the liberal and practical education of the industrial classes in the several pursuits and professions of life. But such other branches of science and knowledge may be embraced in the plan of instruction and investigation pertaining to the university as the trustees may deem useful and proper.” Though the charter has been amended by the New York State Legislature from time to time over the course of the university’s history — to establish, for example, Cornell’s four statutory colleges — its essence has remained unchanged. 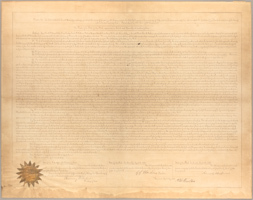 The original charter has been presented to every president of Cornell during the inauguration ceremony. On October 6, 1868 (the day before the university’s inauguration and that of its first president), the Cornell University board of trustees adopted the great seal of the university (also known as the presidential seal), creation of which it had originally authorized in November 1866. The great seal was first published in the Cornell University Register, 1868-1869. As described in the current version of the University’s Bylaws, the great seal is circular in form and two inches in diameter. The outer circle of the great seal bears the words “Cornell University” and “Founded A.D.1865”; the inner circle bears the name of university founder Ezra Cornell and his statement, “I would found an institution where any person can find instruction in any study.” A profile likeness of Ezra Cornell appears in the center of the great seal. The great seal is the only symbol affixed to Cornell academic diplomas and its use is otherwise strictly limited. The custodian of the great seal is the university president. The board of trustees also adopted a corporate seal to be used for executing legal instruments or official University documents other than diplomas. 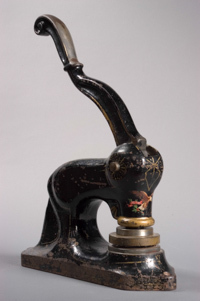 Measuring one and one-half inches in diameter, the corporate seal is smaller than the great seal. Like the great seal, the outer circle of the corporate seal bears the words bears the words “Cornell University” and “Founded A.D.1865”. The center of the corporate seal contains the name of Ezra Cornell and, below his name, his profile likeness. The Secretary of the Corporation is the custodian of the corporate seal. The Cornell mace and baton are present at events such as commencements and inaugural processions and ceremonies. The university marshal carries the baton while forming and directing the inaugural procession. The mace symbolizes the authority of the university as exercised by its principal officers, especially the president. 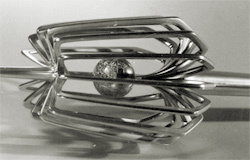 Both the baton and the mace were designed by Sir Eric Clements of the Goldsmiths’ Guild of London in 1962 at the request of President Deane Waldo Malott, under the direction of George Healey, professor of English and curator of rare books, with the assistance of George J. Hucker, professor of bacteriology and chief of research at the university’s New York State Agricultural Experiment Station in Geneva, N.Y. The baton is a rosewood shaft with a wrought-silver triangular knob bearing a rendering of the university arms and surrounded by a frieze of engraved ivy leaves. The mace consists of a tapered silver shaft surmounted by a golden terrestrial globe. The silver ribs surrounding the globe symbolize the universality of Cornell’s interests and the worldwide affiliations of its faculty, students, staff, and alumni.